Lt. 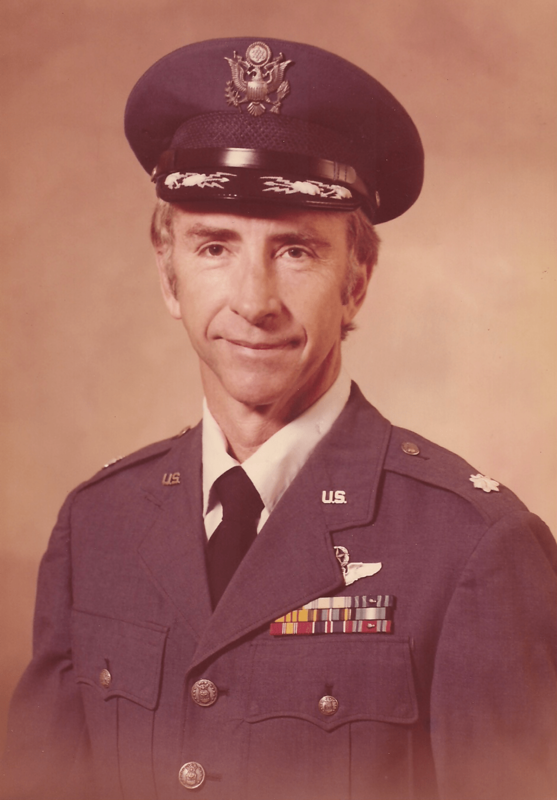 Colonel William E. “Bill” Adams, United States Air Force, retired, was born during 1933 in Arizona. He is the son of Virginia and Eugene Adams, and is a 4th generation Arizonian. Colonel Adams was our 41st Chapter President, serving in 1994 after President Elect George Ziernicki took ill and passed away. In addition to serving as president, Bill was the editor of our chapter newsletter for three years and also planned the social events for several years along with co-chair Jim Seidl. The following is his story told by himself. I attended ASU and in my junior year I enrolled in Air Force ROTC, mainly because they paid $25 per month. In the 50’s, that was a lot of money. I passed the Air Force physical and was offered an active duty flying job, so Carol and I jumped into our 1951 Ford and took off for Lackland AFB for 90 days of basic training. After basic and primary flight schools at Moultrie, Georgia and Laredo, Texas AFB, I had 6 months of fighter gunnery school in the F-84f at Luke AFB, AZ. After Luke, we headed for Nellis AFB Nevada for advanced gunnery school in the F-100A. One of my fondest memories of Nellis was breaking the sound barrier inside the Grand Canyon. 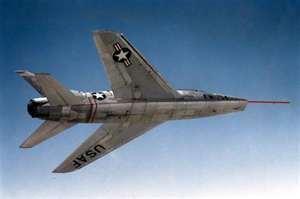 In 1957, we were transferred to Itazuke AFB Japan for three years flying the F-100 C, D, and F’s. Our mission was flying fighter bomber training using the LABS [Low Altitude Bombing System * ] maneuver to bomb our targets. One memory that stands out was sitting on the alert pad at K-8 Air Base, Korea, with a Mark 5 hydrogen bomb strapped to my F-100, waiting the Third World War to start. 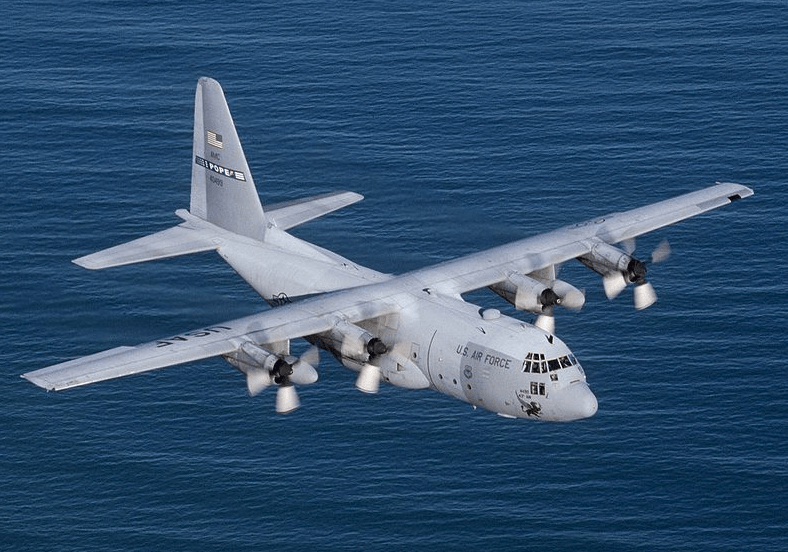 After J apan, we had tours at Luke AFB, Saudi Arabia, Wright-Patterson AFB and ended my Air Force career at Travis AFB, California, flying C-130s. My main assignment at Travis was carryi8ng troopers and cargo into the 3,000 foot runways of the jungle of South Vietnam. On the trips home, we carried wounded troops and body bags out, a very sobering task. Church, New Zealand in November 1965 to support the Navy Base at McMurdo Station, South Pole. Our job was to carry Navy personnel and cargo on the five hour trip to the South Pole. After the point of no return, we had to land at McMurdo, there was no alternate airfield. The runway at McMurdo Station was solid ice and the glide slope on final approach was radar controlled, no ILS [Instrument Landing System]. On one of our return trips, our flight was the first American military aircraft to circumnavigate the South Pole. 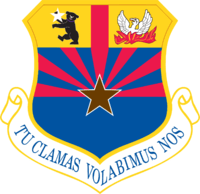 My last assignment was flying C-97s, then KC-97s with the 161st Air Refueling Wing, Arizona Air National Guard out of Sky Harbor Air National Guard Base, which I did for 12 years. I joined American Airlines in 1966. I flew the B-727, the B-707, the DC-9, Super Eighty and the DC-10. I had captain ratings on the 707, the DC-9 and the DC-10. I took early retirement in 1987. In my 31 years of flying over 17,000 hours, I never scratched an airplane (discounting holes in my aircraft caused by Viet Cong small arms fire), and never was criticized by the FAA for a flight violation. All in all, my flying years was a great adventure and I proudly served my country honorable. 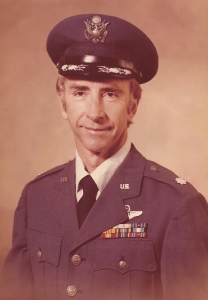 Bill Adams, Lt. Col. USAF Retired. a method of bombing where the attacking aircraft pulls upwards when releasing its bomb load, giving the bomb additional time of flight by starting its ballistic path with an upward vector. 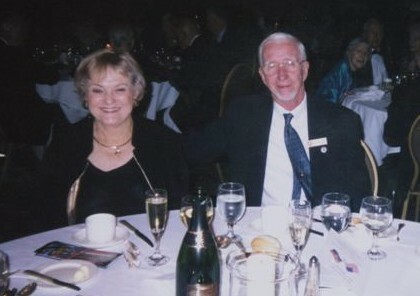 Carol & Bill Adams at our 50th Chapter Anniversary in 2006.